To break the cycle of reliance of government assistance, HUD’s legislation includes a requirement that most public housing authorities (PHAs) offering the Housing Choice Voucher program develop action plans promoting family self-sufficiency (FSS) for client families. 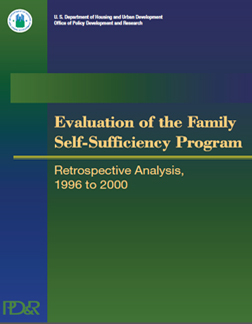 Avenues to family self-sufficiency include individual case management, education, employment, childcare and transportation, and a substantial delayed monetary incentive for families that achieve increases in earnings. PHAs’ FSS plans rely on community partnerships through which these opportunities and services are made available to public housing and Housing Choice Voucher families. Then, in a contractual arrangement of up to five years, an individual family and the PHA jointly target goals, utilizing the support services arranged by the PHA that they believe will enable the family to attain economic self-sufficiency. This study presents a descriptive profile of FSS program participants and FSS programs in terms of size across the country. Using site visits and 1996–2000 HUD administrative data, the study also reports FSS program outcomes and compares them with what changes occurred in similar non-FSS program participants during the same period.